Pandrillus, a conservation organisation based in Nigeria and Cameroun disclosed that former President Olusegun Obasanjo donated a chimpazee named ‘Patience’ to them. The organization, with a location in Calabar, Cross Rivers Stae, are dedicated to promoting the survial of the highly endangered Drill (Mandrillus leucopheus) and providing safe haven for orphaned chimpazees. 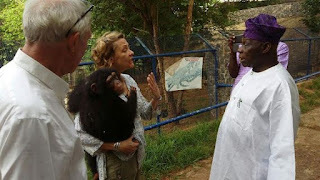 “Seen here at the Olusegun Obasanjo Presidential Library Wildlife Park in Abeokuta – from left: Peter, Liza with Patience, and Mr. President. As President of Nigeria, he visited Drill Ranch in 2001, and made a follow up visit in 2011. President Obasanjo recognises the special care needs of chimpanzees and therefore decided to place 3 year old Patience with Pandrillus so she can grow up in the forest as part of the large chimpanzee group at Drill Ranch Afi Mountain. Patience is a fantastic chimpanzee who has been well cared for by the staff of the OOPL Wildlife Park. Once she has completed her medical screening in Calabar, she will join the group at the newly completed Nigerian Chimpanzee Center – located at Drill Ranch Afi Mountain in Boki LGA of Cross River State. Pandrillus thanks Mr. President and his staff for their logistical support and hospitality during Peter and Liza’s working visit. We also thank Air Peace for carrying all three back to Calabar.